As pointed out originally by Walker et al. (1981), the carbonate-silicate cycle provides a natural solution to the faint young Sun problem. If Earth's oceans were to hav e frozen over early in the planet's history because of low solar luminosity, the hydrologic cycle would have come to a virtual standstill, and silicate weathering on land would have ceased. Carbonate metamorphism would have continued, however, inasmuch as there is a huge reservoir of carbonate rocks - the equivalent of 60—80 bars of CO? — stored in Earth's crust. Thus, on a frozen Earth, volcanic CO? should have accumulated in the atmosphere until the greenhouse effect became large enough to melt the ice. As we shall see below, this sequence of global glaciation followed by CO? build-up and melting may actually have occurred two or three times during Earth's history. During most of Earth's history, however, the negative feedback inherent in this cycle should have prevented this from happening. The reduction in the silicate weathering rate as Earth's surface cooled would have driven atmospheric CO? concentrations higher, warming the climate and preventing further ice build-up. The evidence for this is that Earth has remained habitable, and usually ice-free, throughout most of its history. If one accepts the logic outlined above, then it is possible to turn the argument around and to ask how much CO? would have been required to compensate for redueed solar luminosity at different times in Earth's history, assuming that CO? and !l?0 were the two dominant greenhouse gases. The answer is shown in Figure 13.3 (from Kasting, 1992). At 4.5 Ga, a minimum of 0.1 bars of CO2, or ~3(K) times the present atmospheric level (PAL), would have been needed to compensate for a 30% reduction in solar luminosity. On the other hand, CO? concentrations may actually have been much higher than this (10 bars?) at that time. Somewhat tighter constraints on pCO? can be derived during glacial periods, when both upper and lower limits on surface temperature can be estimated. The limits shown in Figure 13.3 correspond to global mean temperatures between 5 C and 20 °C during the Paleoproterozoic (2.2-2.3 Cía) and Ncoproterozoic (0.6-0.8 Ga) glaciations (Kasting, 1992). Keep in mind, though, that these estimates assume that CO? and H?0 were the only important greenhouse gases (which may not have been true prior to ^2.2 Ga), and they do not account for transient excursions in CO2 that may have occurred during global glaciations. must be balanced by an influx of methane from surface sources. 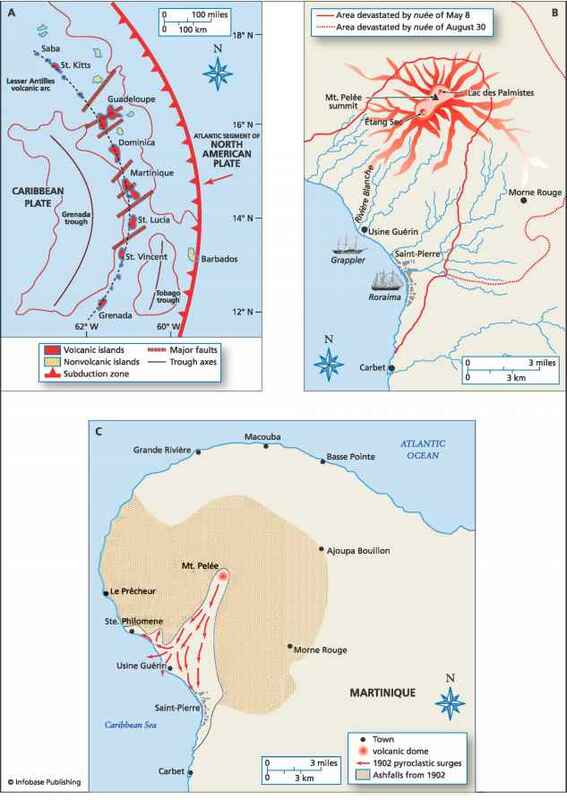 The two dashed lines show possible biotic and abintic surfaee fluxes of CH4. The upper line is the present biological CH4 flux, x HJ1 * mol yr 1, or 1 x 1011 CH4 molecules cm"2 s-1 (Watson et aL, 1990). 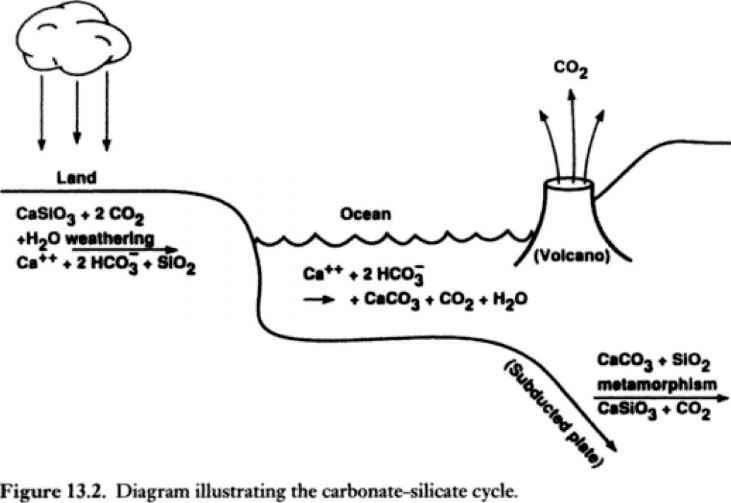 The lower line is the present abiotic source of carbon from mid-ocean ridge outgassing, M.5 x 101J mol yr-1 (DesMarais and Moore, 1984; Marty and Jambon, 19H7). Most of this carbon is emitted as CO? at present, but it could have been released as (- H4 in the past if the upper mantle was more reduced at that time (Kasting and Brown, 1998). The abiotic source was probably not important during the Archean because most of the methane should have been produced biologically. 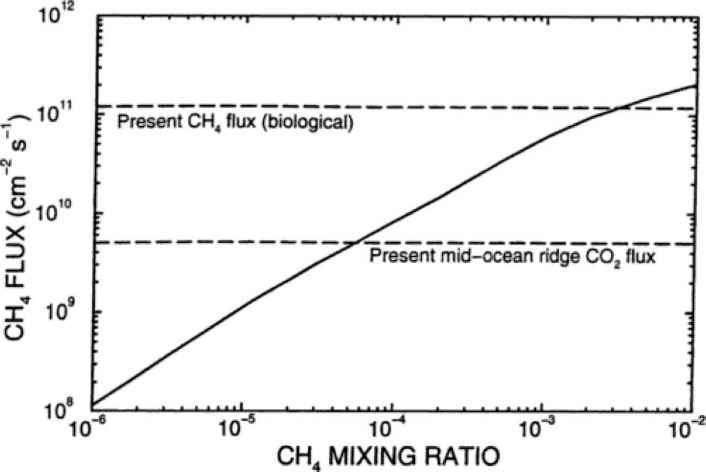 Figure 13.4 shows that a GH4 flux comparable to the present biological methane flux could have produced an atmospheric CII4 mixing ratio of x 10~\ By comparison, the present atmospheric CH4 mixing ratio is M.6 ppm, or 1.6 x 10"4. The difference arises because the photochemical lifetime of CH4 is about 20(H) times longer in a weakly reduced primitive atmosphere than it is today (^20,000 years, as compared with 12 years). A caveat should be added here: This high CII4 concentration implies a correspondingly high escape rate of hydrogen to space if hydrogen was escaping at the diffusion-limited rate (Walker, 1977). The methanogenic biota might have run out of Hi unless hydrogen escape was actually slower than this. It seems likely, however, that this was indeed the case because the exospheric temperature was probably low and the escape was energy-limited (Kasting and Brown, 1998)* So an Archean atmosphere containing 0.1% CH4 is entirely plausible.